↑ "tiger". The Free Dictionary. Farlex. Retrieved 6 April 2014. ↑ Liddell, H. G. & Scott, R. (1940). "τίγρις". A Greek-English Lexicon, revised and augmented. Oxford: Clarendon Press. ↑ Harper, D. (2001–2011). "Tiger". Online Etymology Dictionary. Etymonline.com. Retrieved 6 April 2014. ↑ Harper, D. (2001–2011). "Panther". Online Etymology Dictionary. Douglas Harper. Retrieved 24 October 2011. ↑ Pocock, R. I. (1929). "Tigers". Journal of the Bombay Natural History Society. 33: 505–541. ↑ Pocock, R. I. (1939). "Panthera tigris". The Fauna of British India, Including Ceylon and Burma. Mammalia: Volume 1. London: T. Taylor and Francis, Ltd. pp. 197–210. ↑ Johnson, W. E.; Eizirik, E.; Pecon-Slattery, J.; Murphy, W. J.; Antunes, A.; Teeling, E.; O'Brien, S. J. (2006). 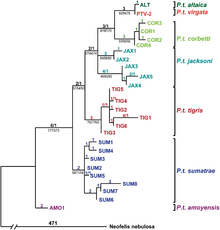 "The Late Miocene radiation of modern Felidae: A genetic assessment". Science. 311 (5757): 73–77. Bibcode:2006Sci...311...73J. doi:10.1126/science.1122277. PMID 16400146. ↑ Davis, B. W.; Li G.; Murphy W. J. (2010). 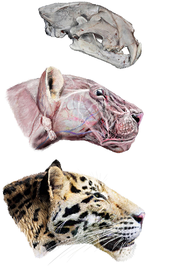 "Supermatrix and species tree methods resolve phylogenetic relationships within the big cats, Panthera (Carnivora: Felidae)". Molecular Phylogenetics and Evolution. 56 (1): 64–76. doi:10.1016/j.ympev.2010.01.036. PMID 20138224. ↑ Mazák, Ji H.; Christiansen, P.; Kitchener, A. C. (2011). "Oldest Known Pantherine Skull and Evolution of the Tiger". PLoS ONE. 6 (10): e25483. Bibcode:2011PLoSO...625483M. doi:10.1371/journal.pone.0025483. PMC 3189913. PMID 22016768. John Hampden Porter (1894). "The Tiger". Wild beasts; a study of the characters and habits of the elephant, lion, leopard, panther, jaguar, tiger, puma, wolf, and grizzly bear. pp. 196–256. Sankhala, Kailash (1997). Indian Tiger. Roli Books Pvt Limited, India. ISBN 978-81-7437-088-4. Year of the tiger. Video collection on occasion of the Year of the Tiger, 2010. BBC. Video clips. BBC archive on Wildlife Finder. "Is this the last chance to save the tiger?". 19 November 2010. By Pralad Yonzon. The Kathmandu Post. "India's tiger population increases by 30% in past three years; country now has 2,226 tigers". 20 January 2015. By Vishwa Mohan. Times of India. Retrieved 17 July 2016.